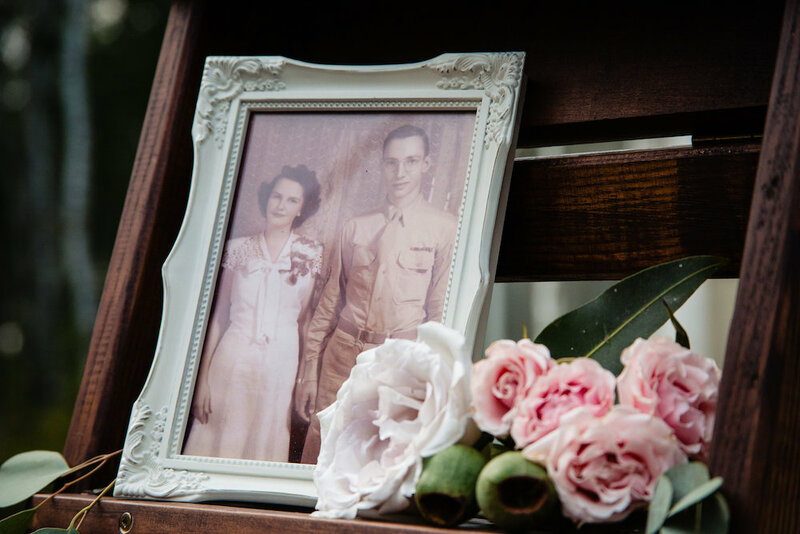 Kristin and Mike’s wedding was fairly simple as far as the florals go (in fact, I didn’t use a single flower throughout the entire wedding! Just greeneries!) but it was one of my favourites of 2018 nonetheless. Why? 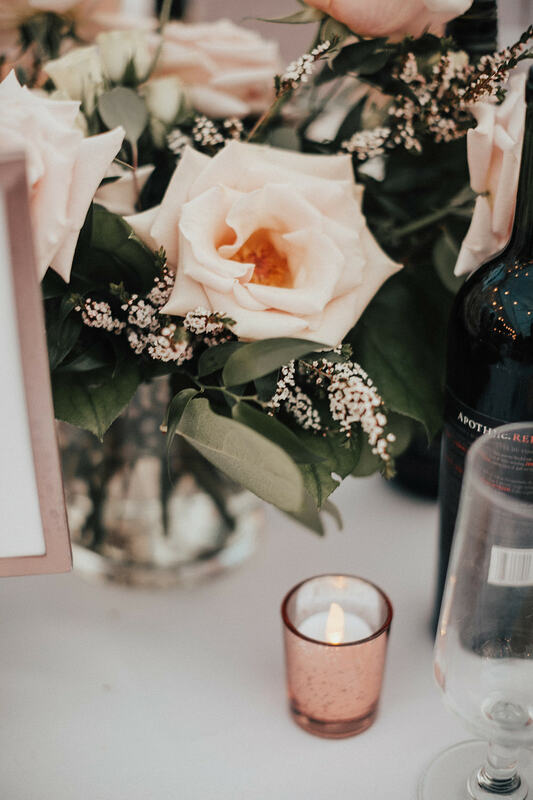 Because the clean, modern design perfectly reflected their cool style and in the end, their wedding was just exactly what they wanted: an intimate celebration of marriage with amazing food, good wine, and a phenomenal atmosphere. Like I said, this entire wedding didn’t contain a single flower. Everything I did was using foliages, and while I’m normally a flower devotee, I really loved how Kristin’s vision came together. Her bouquet was composed of olive, seeded eucalyptus, silver dollar eucalyptus, leather leaf fern, and plumosa fern. Her bridesmaids carried smaller versions, which brought a bit of freshness to their gorgeous dress palette of mixed pale pinks, taupes, and berry tones. The ceremony and reception took place in the same space, and Hut K’s gallery isn’t a large space to begin with, so they had the majority of the guests seated at their dining tables, with a few family members up at the front (later, the head table would be placed in that space). 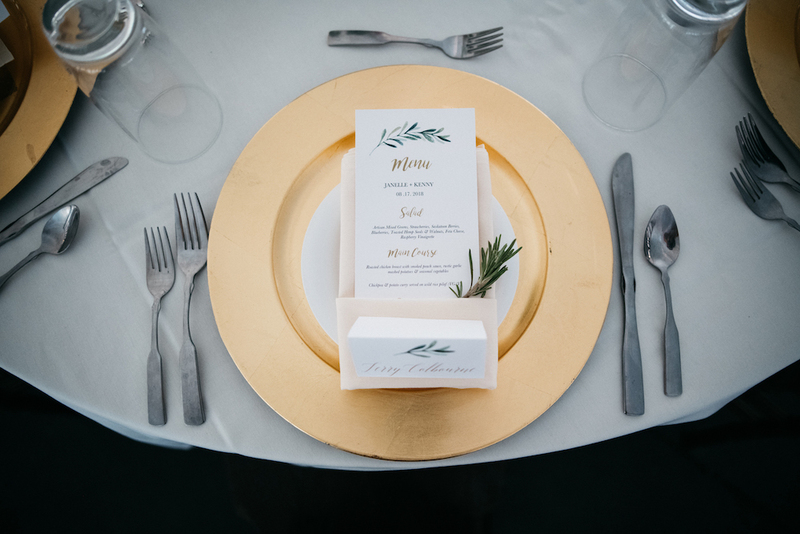 We tossed around a few design ideas that I loved, and in the end Kristin chose to stick to her minimalist core, with a simple greenery wall installation to bring a bit of natural wildness into the modern, clean venue. I love the way this reception is laid out, don’t you? I didn’t actually put anything on the tables as centrepieces! The couple knew all along that they wanted to have platter after platter of incredible food lining each of the tables, so they made the smart decision to keep them as empty as possible. 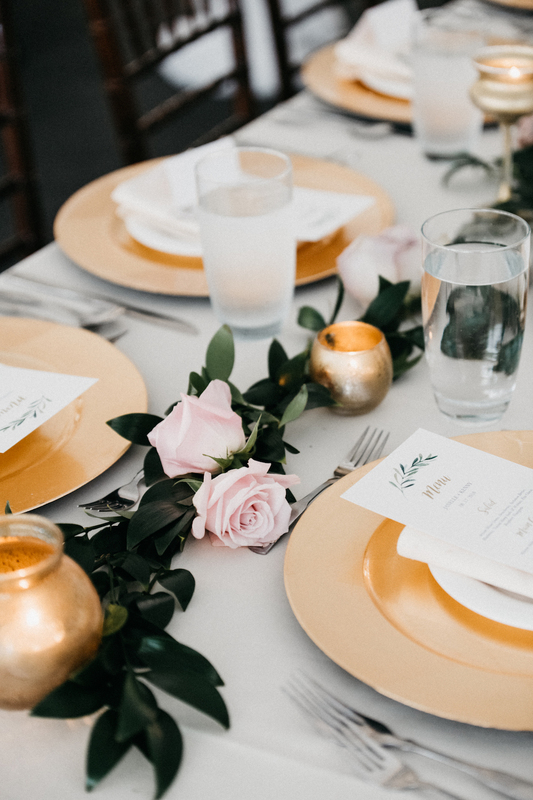 There’s nothing more challenging at a wedding than trying to find space for platters of food served family-style when you’ve got a garland lining the table or flowers everywhere - and that is coming from a florist 😂All that to say, make decisions that actually make sense based on your wedding plans and what will make the best experience for your guests! The one thing I did add to the tables was a sprig of locally grown organic rosemary at each place setting. 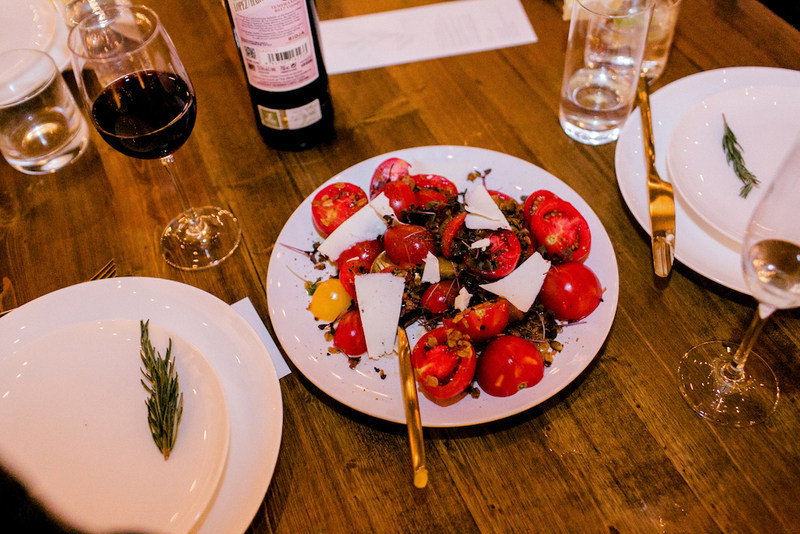 The herb/greenery touch on plates is always popular, and I always suggest that we use a chemical-free sprig. I would hate to leave behind something that could potentially make someone ill - and the same goes for cake flowers! I’m already booking appointments for 2020 wedding consultations! I offer a limited number of dates for event design each year, in order to allow me to work closely with each couple. 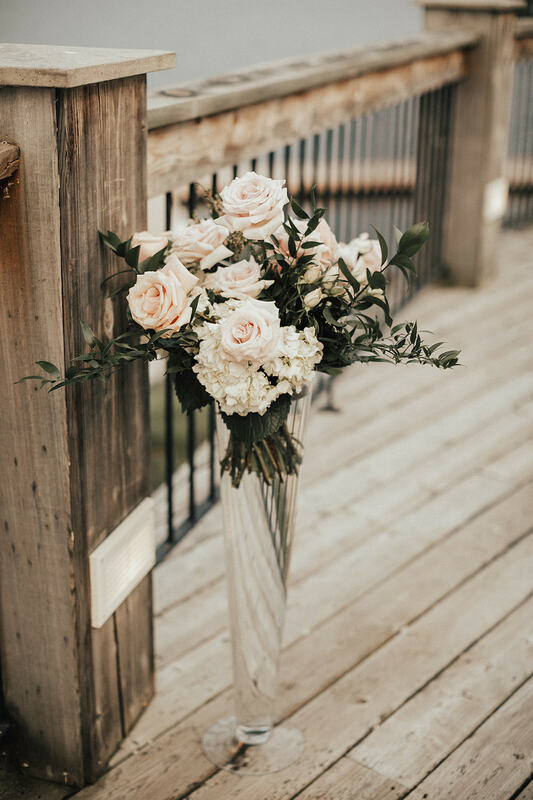 Combining event and floral design is the perfect option for couples who live out of town, or couples who feel they need a little extra help in creating the visual plan for their wedding day. Click this link to learn more! 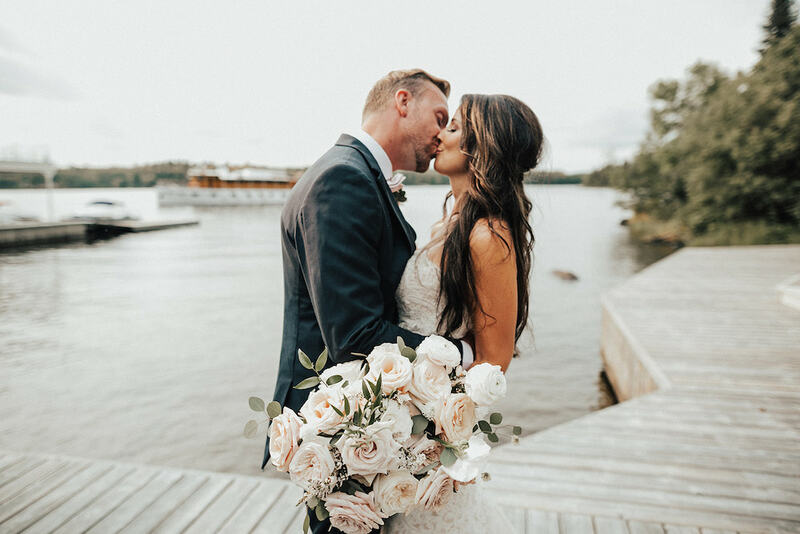 My favourite thing about Janelle and Kenny’s summer wedding at Pineridge Hollow was hands-down the colour palette: we chose a watery, muted oyster palette with dusty pinks, light blues, and lavenders. When I picked up my flower order and saw how the flowers were starting to come together, I got REALLY excited. Like, really excited. It was like a cotton candy dream come true! And just look at how beautiful the colours with the bridesmaids’ dresses were! I think it’s pretty obvious why I loved these flowers :) It was such a lovely combination! Janelle wanted her bouquet to be a pretty good size but not too huge, and designed in a modern cascading style. The bridesmaids carried simpler handtied bouquets, all to coordinate with Janelle’s - isn’t that cotton candy pastel palette to die for? 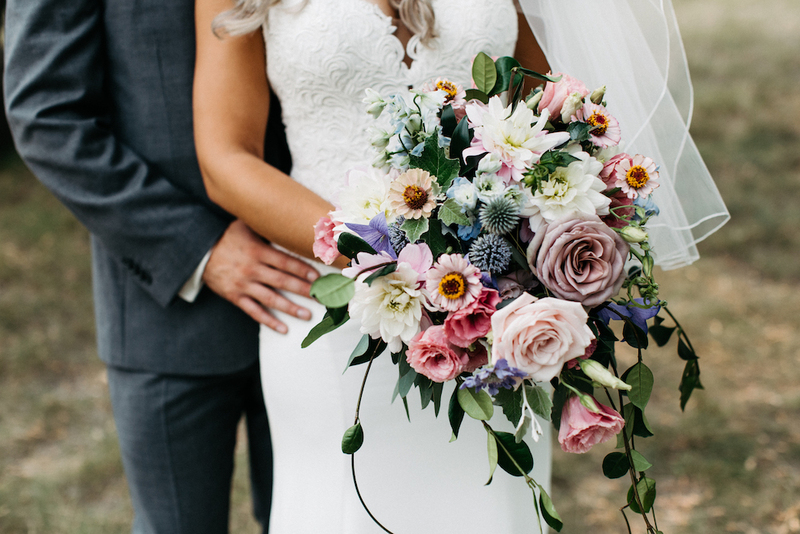 Bridal Bouquet ingredients: several varieties of roses, dahlias, locally grown lisianthus and zinnias, delphinium, blue bells, and globe thistle with this gorgeous trailing jasmine and nagi foliages to help create that cascading shape. It’s pretty hard to choose a favourite ingredient in these bouquets, but I think it’s a tie between the “zinderella” zinnias and the globe thistle for me! The wedding ceremony took place in front of the gardens at Pineridge Hollow, which were beautifully in bloom! I really went for it with this large, asymmetrical floral piece added to the arch. I loved adding in the very long, full branches of white poplar - they add a ton of texture thanks to the leaf’s shape and colour variegation, and of course, the shape that the full, arching stems creates can’t be beat. Mauve roses and pink lisianthus filled out the florals! 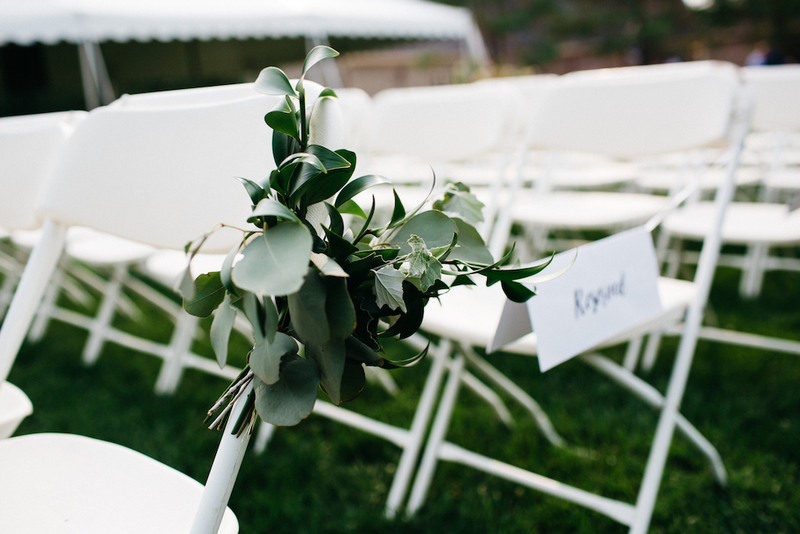 We also added simple greenery bouquets down the aisle. 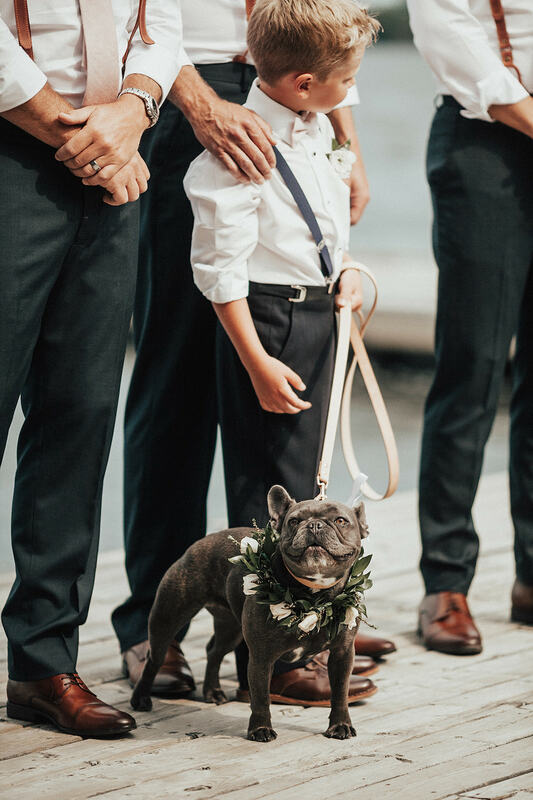 I don’t normally recommend doing too much down the aisle as I personally prefer to keep the focus at the front, but these guys were super cute and definitely added to the woodsy feel. 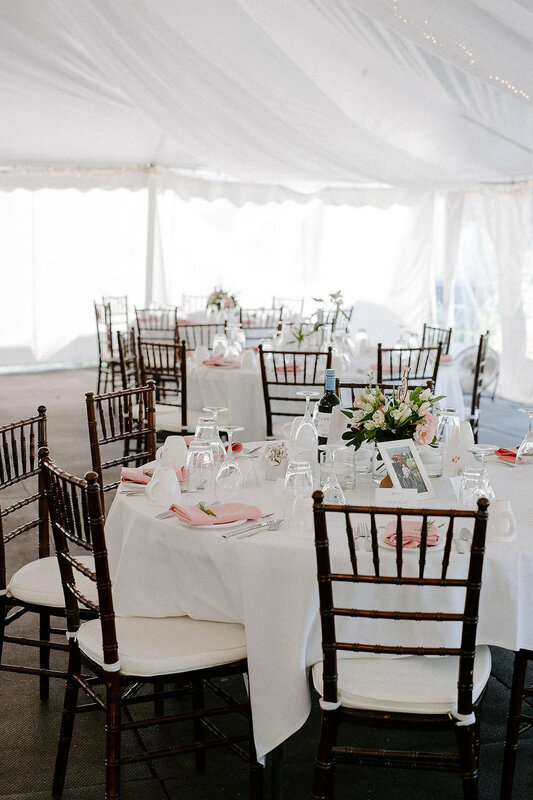 Inside the tent, Janelle created a really great floor plan with a mix of both rectangular and round tables. White linens, mahogany chivari chairs and gold accents set the perfect neutral backdrop. The round tables had a low floral arrangement, with a touch more vibrancy than the bouquets but overall a very similar palette, and the rectangular tables featured loose greenery tucked along the length of the table (PSA the tables at Pineridge Hollow are quite narrow, so just keep that in mind if you’re planning a wedding there!) with individual roses in blush and mauve and gold candleholders added in. It was a very full table, but looked beautiful! 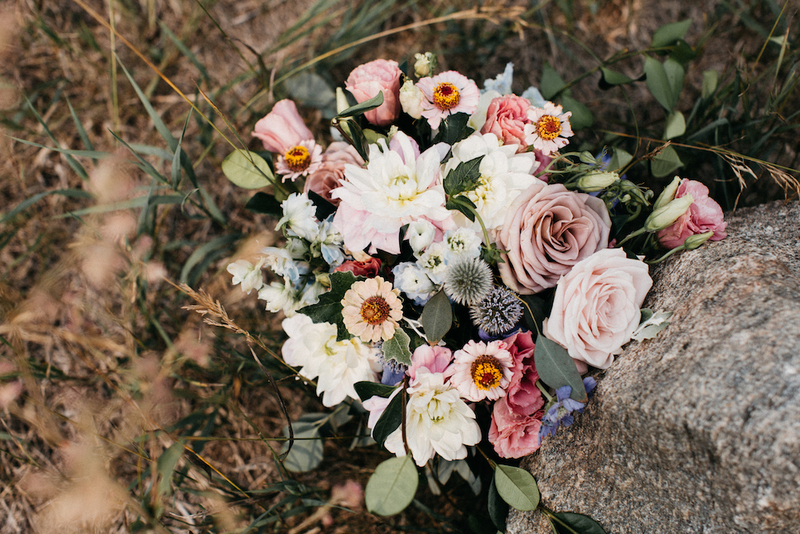 Meredith and Dylan’s wedding at Pineridge Hollow was such a sweet, feminine day with a garden-inspired style. What I remember from when I sat down with her was that she really wanted the flowers to soften the inside of the tent, and make it feel like an outdoor garden party. We planned a few different ways to bring the outdoors in and kept everything really soft, pretty and girly! Meredith’s bouquet was feminine, fragrant, and ruffled with a bit of a whimsy. I loved the pastel lavender accents mixed in with the soft pink and cream palette. Bridal Bouquet Ingredients: White o’hara garden roses, lisianthus, larkspur, stock, yarrow, scabiosa, veronica, and nagi foliage. We also did a hair piece for each of the women - I decided to do them all on combs so that however each of the girls chose to wear their hair, the floral could be easily tucked in. Aren’t they so cute? I love this outdoor space at Pineridge Hollow! I think they call it their woodland area, and it’s such a lovely ceremony spot (though it’s always been SUPER HOT every time I’ve been there…just a head’s up - I think this spot gets a lot of sun!). 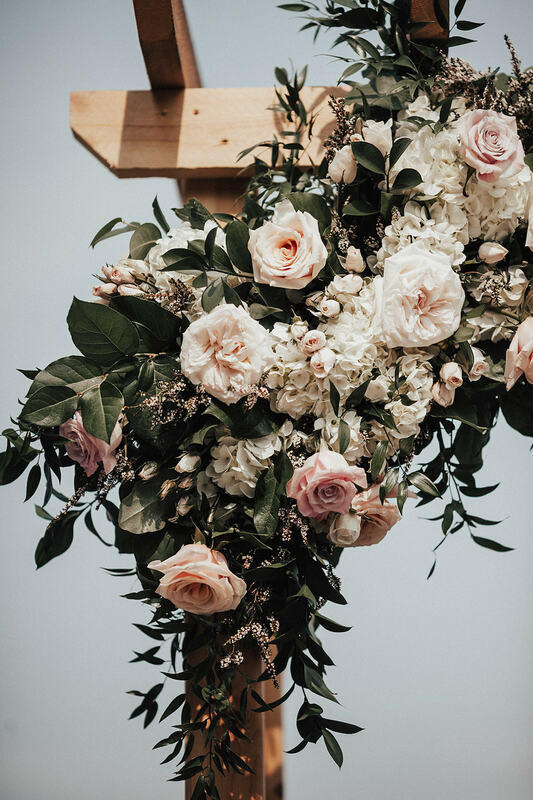 The couple provided the arch and the drapery, and we designed the airy and light floral piece on-site (it’s always a treat to be able to do this!) and added the greenery bouquets to the aisle. One of the statements we wanted to make at the reception was at the head table. I love creating hanging installations and I think there’s no better way to bring the outdoors in. This piece was whimsical, airy, and really natural. It was built on a branch that I scoured all spring for (I have a bit of a branch hoarding tendency), using moss, airy plumosa fern, and larkspur - all chosen for their lightness! I also built a greenery installation at the tent opening so that when guests walked in, they were greeted with a feeling of the outdoors. You can sort of see it in the picture below :) We did a few different centrepiece styles, all with candles added, and I also added fresh flowers to their cute little cutting cake. Ah, Jenn and Bill’s wedding day. It was SUCH a good day. Late August (the day before my birthday, in fact!) is a gooood time for a wedding because it’s not QUITE as hot as the rest of summer and the weather is basically always perfect. Except that it actually rained throughout the evening of their wedding - which I’m telling you, has NEVER HAPPENED ON MY BIRTHDAY BEFORE. So I may or may not have told them that they’d have perfect weather and I may or may not have come out looking like a liar. 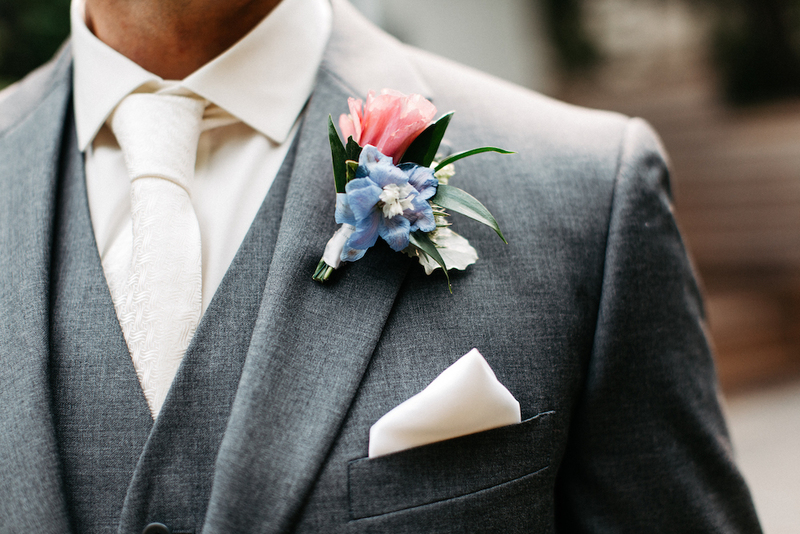 BUT, this garden-inspired wedding at Cielo’s Garden was one of my favourites of the year. A unique take on a purple palette with some of the most subtle combinations (you’ve heard me say before that I think ultra-violet is one of the most offensive colours of all time but this? This take on purple was gooooood), flowers literally everywhere, and a light and airy feel that just made this wedding feel special. I would happily re-live this day over and over again! This bridal bouquet was one of my favourites! I felt like it was such a unique take on the colour palette and I really, really loved the combination that I got to use. The colour and texture depths were really lovely. Bridal Bouquet Ingredients: early grey roses, menta roses, amnesia roses, pink stock, white larkspur, locally grown white sweet pea, black pearl lisianthus (drool!) and scabiosa, with mixed eucalyptus and foaged foliages. I finished it with this gorgeous mauve Stella Wolfe ribbon that I’d been hoarding all year. Working with Jenn was one of the best experiences I’ve had as a wedding floral designer. Why? Because she trusted me SO much. She loved my style, and she knew that with her busy life AND the fact that she doesn’t live in Winnipeg anymore, she decided to just hand over the reigns and chose not to worry about anything. That made this wedding a dream for both her and me! Outside of just flowers, she asked me for vendor recommendations (helllloooooo gluten free desserts!!) and when I suggested that she consider hiring a month-of wedding coordinator, she trusted me on that, too. I actually always recommend that couples getting married at a venue like Cielo’s Garden, where there isn’t a banquet coordinator on-site (like you’d find at a hotel or a golf course), always hire at least a month-of coordinator. There’s no need for you to have to run your entire reception when you could be enjoying it! Is there such a thing as TOO much trust? Ha! Jenn trusted me so much that she actually didn’t bother to review her flower order because she knew that I had it all under control…except she forgot that she had added a bridesmaid since the last time we talked! 😂There were a few stressful moments when that was figured out - I was working on the ceremony instal in the chapel and the wedding coordinator asked where the 5th bridesmaid bouquet was. “What 5th bridesmaid?” was my response. It actually worked out really well - I stopped working on the chapel instal, the couple did their first look photos in the chapel, and I took flowers out of the buckets that were ear-marked for the ceremony arch and sat on the ground outside and whipped together another bouquet! Ironically, that was the one day I chose to take extra ribbon OUT of my tool bag since I wouldn’t need it, but the wedding coordinator had some bits and pieces that I could use. 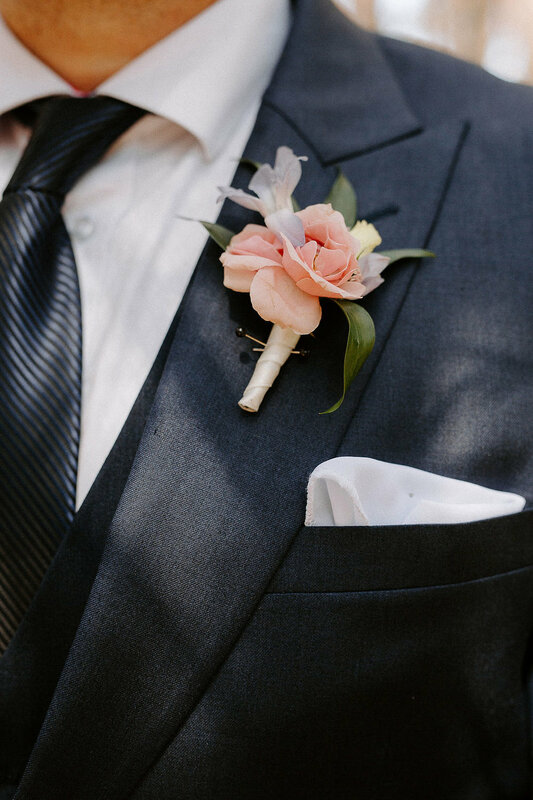 By the time the first look photos were finished, so was that bouquet! I was also very sweaty - ha! I’m sure you could guess without too much effort why this ceremony design was one of my favourites of the entire year! I always love coming up with different ideas to implement for ceremony spaces, and especially when it’s such a beautifully blank canvas as Cielo’s Garden is. Creating a freestanding, deconstructed arch had been on my design wishlist for a while after seeing some similar styles on Instagram, so when I suggested it to Jenn, I was pretty pumped that she loved the idea. She really let me just do whatever I wanted! I decided to use the same ingredients as the bouquets (which was very lucky when I had to create that extra bridesmaid bouquet!). The reception was also full of beautiful things! Literally flowers everywhere! 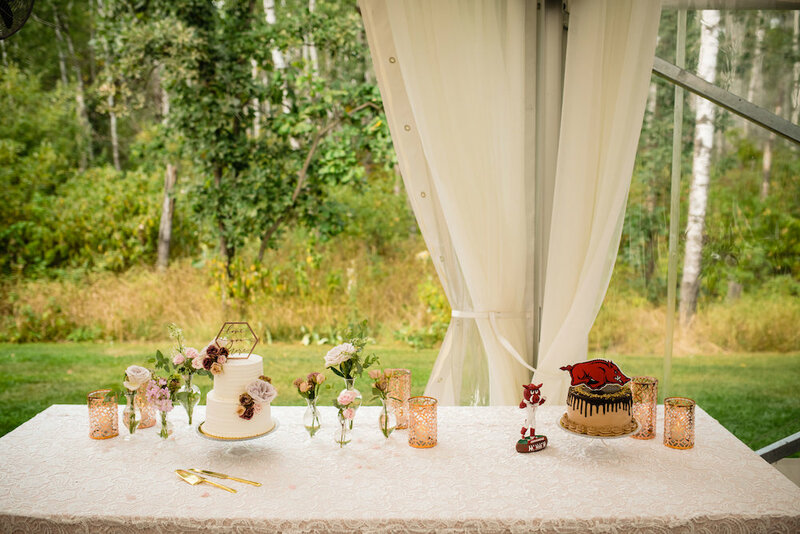 I was so impressed with the level of detail that Jenn brought considering that she lived out of town throughout the entire planning. 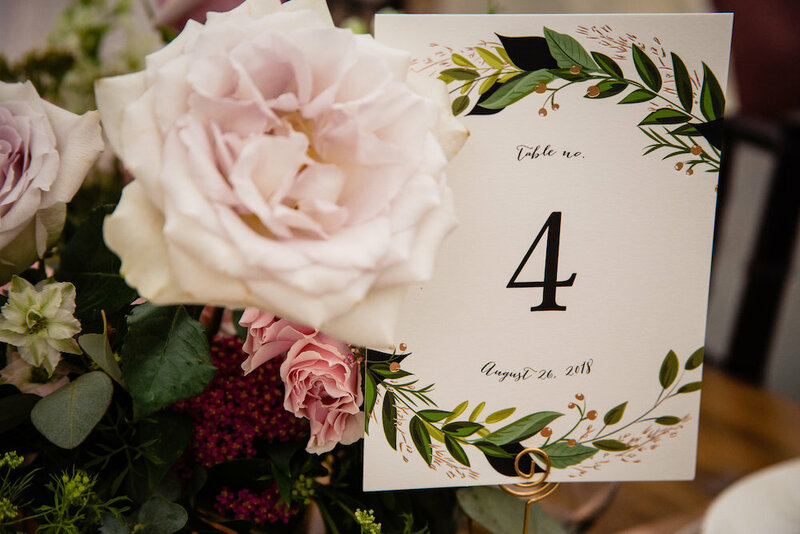 The gorgeous rose gold and copper place setting details were from C&T Rentals and though you can’t see it too well, the vases that the centrepieces were in are also copper, which I felt really complemented the floral palette nicely! We also tucked in flowers throughout the guest book table are, the bar, and of course, on the cake. 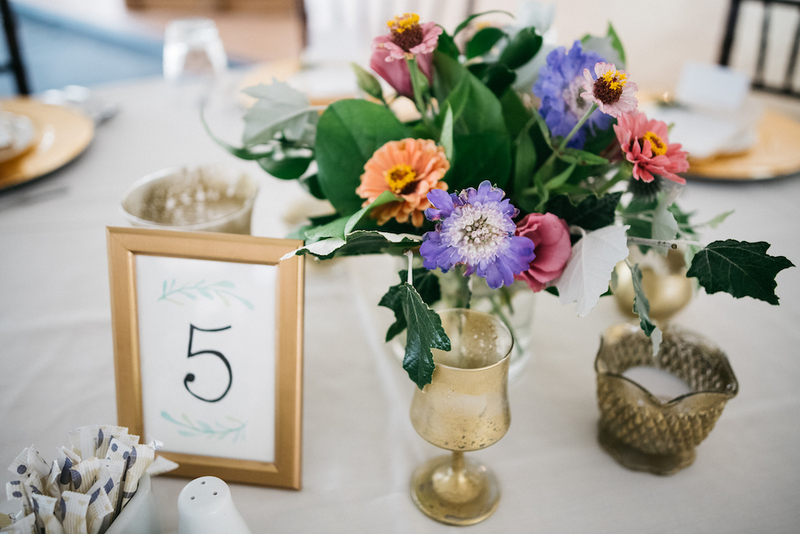 I am a bit of a fan of flowers, flowers, everywhere :) And then they also brought the ceremony arrangements and placed them behind the head table, which looked so pretty!